When you submit a review for a game in Gamestar Mechanic, you can specify a number of stars (labeled Rating) and a number of gears (labeled Difficulty). Check out how these ratings work. 0 stars: If you don’t select a star rating, it appears as 0 stars, indicating that you have no opinion that you want to share. Rather than give a game 0 stars, it’s often better to leave a comment instead. 1 star: The game is of poor quality throughout, implementing little or no detail and using no recognizably interesting elements. 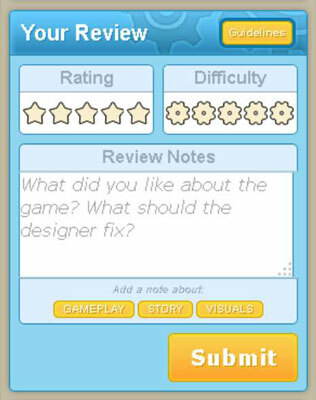 Use this rating sparingly because Gamestar Mechanic is an all-ages program for designers of varying skill levels. If you feel that you leave a 1 star rating, be sure to point out how the game could be improved. A 1-star review with no text is often flagged as inappropriate. For contests, games with heavy dialogue, and other non-gameplay-focused genres, don’t give a rating of 1 star because the game itself isn’t fun. Either rate the game based on the qualities it wants to express, or simply leave a comment. 2 stars: The game is in need of improvement in several regards, lacking a good core gameplay or story. However, these games may also have good qualities, which you should point out in your review for constructive feedback. 3 stars: The game is a good one, with a solid foundation and entertaining elements, but some levels have notable problems, or some parts just aren’t fun. Leave a balanced review for this game, with lots of positive suggestions and ideas on how to improve. 4 stars: The game is well designed, with lots of good components and solid ideas. It has a few noticeable errors, which you should point out only after establishing why you thought the game was good. A 4-star game warrants a mostly positive review, but the designer also deserves a clear idea of what could be improved. 5 stars: The game is of exceptional quality throughout, with few problems and many virtues. Most or all of the game is particularly impressive. A 5-star rating doesn’t require much detail, but it’s always helpful to point out why you enjoyed a game — it helps the designer understand which elements were well received, and it makes your rating more meaningful. Negative reviews can have a rippling effect. A bad review can hurt the average rating of a game, reducing the ranks of its potential players. If you’re unsure how to review a game, round up your rating to the nearest star or simply leave a comment. In addition to the star rating system, Gamestar Mechanic has a gear rating system, which measures difficulty. Displayed to the right of the star rating system, the Difficulty rating is an assessment of how difficult you found the game to play. Don’t worry about your own bias corrupting your difficulty review (rating games at high difficulty because of low skill, or vice versa). The overall difficulty rating of a game represents the average difficulty its players had in completing it — there’s nothing wrong with individual bias in the long run. 0 gears: By not leaving a difficulty review, you’re indicating that you don’t want to share an opinion on the difficulty of the game, such as for a game with more story and visuals than gameplay. You may also refuse a gear review if you didn’t complete enough of the game to give an informed evaluation. 1 gear: A 1-gear game is quite easy, taking little effort to beat and providing no real challenge. If you can’t think of any challenging aspects of the game, 1 gear is appropriate. 2 gears: The game is relatively easy to play, with straightforward overall requirements and simple premises. However, you can understand how the game could be challenging to other players, because it has recognizable elements of difficulty in the levels, whether or not you personally see them that way. 3 gears: This game is fairly challenging, with gameplay difficult enough to make for an engaging experience. It took some effort for you to win the game, and the level of challenge is moderate. 4 gears: This experience was a legitimately challenging one, taking a considerable amount of effort to complete. A game such as this is well balanced for your particular level of play. 5 gears: Either this very difficult game required a great amount of effort to complete, or you were unable to complete it because of its challenge. This rating can either be the mark of a satisfying game or a frustrating one, so be sure to point out which one it is in your review.